This note shows how to use the httr package to scrape the results of a search form. In this blog post, Baptiste Coulmont looks at some French nomination decrees published in the Journal officiel de la République française (JORF). Every nomination published by the French civil service is expected to be available from this JORF search form. checkboxPeriode is a checkbox that can be set to "on" to search in a date interval; the two dates are configurable through six day, month and year parameters that start with champDatePublication. By setting up a POST request with httr, we can programmatically scrape any temporal interval from the search form. Doing so, we can scrape the first page of the results, determine how many pages of results there are, and then scrape all nomination decrees available through the search form. while setting the values of champNom, champPrenom, etc. The download method consists in downloading the complete list of nominations published during the sampled time periods, which is slow but allows to compare the quantities of sampled documents to the quantities of the full data. It also allows to change the document sample entirely if needed. The script will show that early years (1990–1993) return less total documents than all following years, or even no documents at all for year 1993: some of the data for that period are highly likely to be missing. 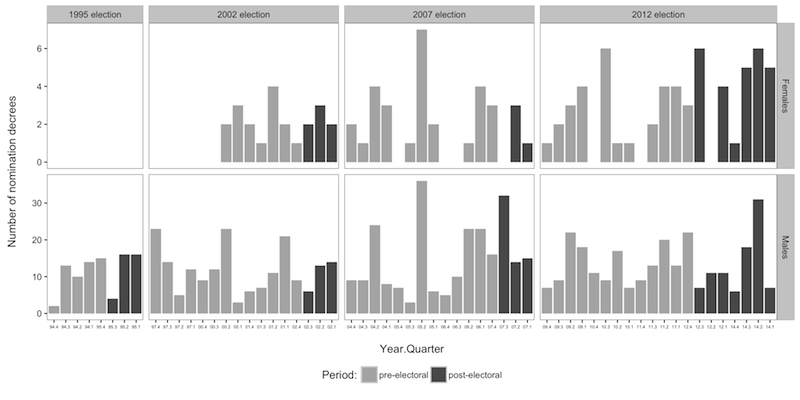 Post-electoral periods do not seem to differ radically from pre-electoral periods as far as the examined nominations go. There are, however, several periods during which nominations to either ambassador or consul status have been markedly more numerous. The code to run the scraper and produce the plot above appears in this Gist.